Learn all about Mary kay cc cream. Light, medium, deep, reviews about it, its ingredients and its cost. This product, according to Mary kay acts like makeup and is formulated like skin care. It delivers correcting properties to cover skin imperfections and discolorations instantly, and delivers eight skins caring benefits in one go. It comes in shades as very light to light, light to medium and medium to deep. Mary Kay CC Cream Sunscreen SPF15 is a complexion correcting cream that acts as make-up while providing skincare benefits. The CC cream protects skin against UVA and UVB rays with SPF15, while also brightening, hydrating and concealing the skin. The CC cream has been formulated with mineral-based pigments that help correct imperfections and improve the overall complexion with lightweight coverage. It minimizes redness and signs of ageing. Mary kay cc cream comes in a squeeze tube with a pump and dispenses out easily. The consistency of cream is rich just as a moisturizer. Coverage is light to medium and it can cancel out redness and very light post acne marks. It has SPF so it looks little light but is tolerable. The only cons with this product is it does not offers a wide range of shades.it is a pretty awesome daily face base because it is light weight, doubles as a moisturizer, has SPF and has pretty good coverage. What is Mary kay cc cream? 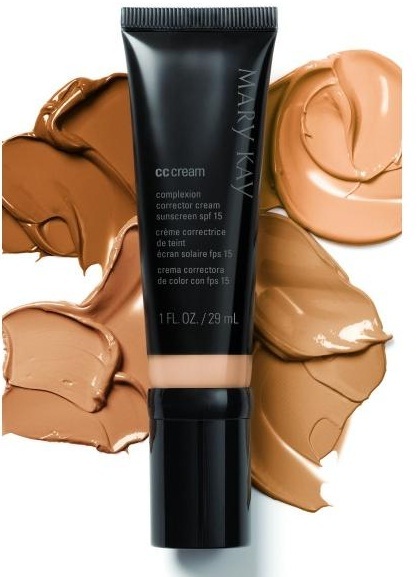 Mary Kay CC Cream Sunscreen Broad Spectrum SPF 15 acts like makeup to instantly correct complexion imperfections while formulated like skin care to help nurture skin’s beauty tomorrow. So remarkably lightweight, you’ll look naturally flawless as if wearing nothing at all. From instant brightening to protection against future damage, hours of hydration to diminishing the look of blemishes and redness, this silky formula leaves skin looking healthier, younger and more vibrant. It’s a can’t-miss if foundation is more coverage than you need, or if you want an easy, out-the-door option without that “made-up” look. It is suitable for all skin tones, skin types, and acne-prone and sensitive skin. It is also oil-free, fragrance-free, non-comedogenic, and dermatologically-tested and tested for skin irritancy and allergy. This is non-irritating. It gives very light coverage, so not so much of a “makeup” feel. Mineral-based pigments help correct the look of imperfections and improve your overall complexion with lightweight coverage that doesn’t give that “made-up” appearance. It instantly amplifies skin luminosity and brightens the complexion. Radiance is enhanced as the formula helps correct the look of skin discolorations and gives skin a more unified tone. Mary kay cc dream deep can be used over sensitive skin. It covers almost all the acne marks and hyperpigmentation over the face. It is best for the dark complexioned people. Even on the oily skin type it remains and have the same effect over 8-10 hours after appliance. Mary kay cc Cream Light to medium for 1 FL oz. /29 ml is of $15.